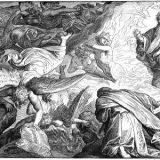 The reading for the Fourth Sunday after Trinity comes from near the very end of Genesis as well as the end of the “generations of Jacob” which began in Genesis 37:2. 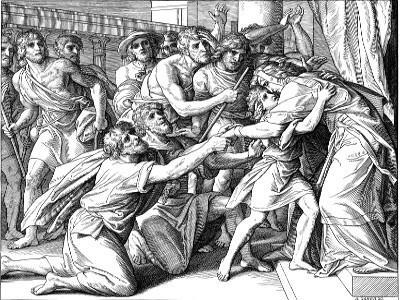 Joseph’s brothers continue to feel guilty about how they treated him. When Joseph revealed himself to his brothers earlier, he emphasized that “God sent me before you to preserve life” (Genesis 45:5). However, after they had settled in Egypt and Israel died, their guilt returns, imagining that Joseph had been biding his time out of respect for his father. They even attempt to frame their plea as if Jacob had commanded it, which does not appear to be the case. Their fear, however, is faithless. Joseph had already forgiven them when he revealed himself to them, but they have forgotten. It is not groundless, to be sure, considering their horrific conduct toward their own brother, but to return to such fear of punishment after hearing a word of forgiveness is to treat that word as false. As John says, “Whoever does not believe God has made him a liar, because he has not believed in the testimony that God has borne concerning his Son” (1 John 5:10). “You shall not put the Lord your God to the test, as you tested him at Massah” (Deuteronomy 6:16). In a similar way, Joseph’s brothers are treating him like a liar, which moves him to tears. Joseph, nevertheless, reaffirms the word of forgiveness, because the sinful soul is often tempted with memories of past sins. “If you, O Lord, should mark iniquities, O Lord, who could stand? But with you there is forgiveness, that you may be feared” (Psalm 130:3-4). “A bruised reed He will not break, and a faintly burning wick He will not quench; He will faithfully bring forth justice” (Isaiah 42:3). A Christian troubled by doubts should be pointed to Christ, rather than to himself, and he will see that Jesus is indeed faithful. Joseph’s brothers have forgotten and have returned to their fear, but they are pointed again to that mercy. Because Joseph reiterates the same word of comfort from before, he also re-emphasizes the Providence of the Lord. Paul’s affirmation “that for those who love God all things work together for good” (Romans 8:28) demonstrates that God is not limited. The temptation is to regard Providence as using primarily those things which we regard as “good” or perhaps focusing on God’s direct actions in history. Evil, in that sense, tends to be treated as a problem to be dealt with or acted against. The Lord, to be absolutely sure, is not the author of sin. But God is not limited in His options. God will accomplish what He chooses to do without fail, even if He wills to use an evil as the means to that end. Adam fell because of his own sin and became a lawbreaker, but the Lord uses the Fall toward His purpose of sending Christ into the flesh. “I form light and create darkness; I make well-being and create calamity; I am the Lord, who does all these things” (Isaiah 45:7). 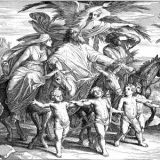 In Joseph’s case, the Lord uses the evil which his brothers intended against him as the means for providing for many people. History does not just happen and the Lord somehow reacts to it. God is the Lord of history, and all things fall under His Providence. The reason why this can be so difficult for us is that we only have a small part of the picture and imperfect knowledge. We are caught up in the moment and cannot see how everything is working together. Very often, this becomes clearer in hindsight, though not always, because only God knows all things. But this should not cause us to fear. Joseph comforts his brothers by pointing to the Providence of God. Yes, their action was very evil, but they recognize it as the sin that it is (1 John 1:8-9). However, despite their wickedness, God uses it for a far greater good. Not as an afterthought, not as a reaction, but as the means through which many lives were spared in the famine which it pleased the Lord to send. If the Triune Lord could use even that evil as a means for good, will He not much more give you the good which He promises to give? “So do not fear; I will provide for you and your little ones” (Genesis 50:21).